A social worker suffered a fit after she was kicked in the head during violence started by a senior project manager, a court heard. Paula Whitehead and her husband Paul had both been pushed to the ground in the “confusing and upsetting” sustained assault. Mr Whitehead, who had been punched, suffered a broken finger and found red raised areas, consistent with bite marks on his thighs and arms after the melee. His wife insisted he had a HIV test, but a judge found attacker Ben Heap, who was not known to his victims, did not bite or kick him. Burnley Crown Court heard how Heap began the early hours trouble with two couples coming out of the same pub he had been in because he had had a row with his girlfriend and was possibly annoyed they appeared to be happy and having a good time. Heap, 28, described by his bosses as a role model, had goaded his victims, He had pushed Mrs Whitehead to the ground and when her husband came to her aid, hit him. Mr Whitehead got up, the two men then had a fight and both of them went to the ground. Heap caused a fracture to Mr Whitehead’s little finger and he didn’t yet know if the injury was going to be permanent. The court was told he had to have his hand strapped up, had two weeks off work and was then put on light duties. His wife suffered injuries to her face and had to have three weeks off work. 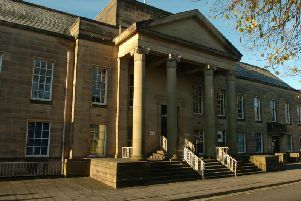 The defendant, of Burnley Road, Briercliffe, had admitted affray after the incident last September 21, but a trial over the facts had been held. He was given 16 weeks in custody, suspended for a year, with 60 hours unpaid work and supervision. The defendant was ordered to pay £1000 each to the Whiteheads in compensation, £250 costs and a £100 statutory surcharge.